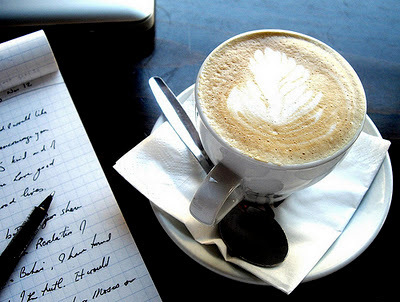 A MindStir Media Blog | How to Publish Books: Is Caffeine a Writer's Friend...or Enemy? Drinking caffeine seems to go hand in hand with writing, but have you ever stopped to think why? I mean, other than temporarily relieving sleepiness and increasing alertness, do writers actually notice any improvement in writing ability while consuming caffeine? I personally haven't found that caffeine enhances my writing skills in any way. I sometimes write a bit faster if I've consumed large amounts of caffeine, but there's never any noticeable difference in writing quality. Caffeine may actually cause insomnia and daytime sleepiness. I'd dare say that many writers struggle with insomnia on some level, so it's quite alarming to think that your caffeine consumption could be making things worse! High doses of caffeine can be toxic and impair coordination. Now this mostly applies to athletes, but writers could experience a drop in typing and organizational skills, two very important aspects of writing. Caffeine doesn't usually improve learning or memory tasks, so don't expect to gain some sort of super brain due to caffeine consumption. Caffeine withdrawal may be debilitating for some writers. Withdrawal symptoms seem to occur about 12-24 hours after abstinence and can include: headache, fatigue, decreased alertness, drowsiness, difficulty concentrating, irritability, flu-like symptoms, and more. I've personally experienced heart palpitations, nervousness, and headaches after drinking about 3 cups of coffee. Needless to say, I couldn't continue writing with those symptoms. In conclusion, a cup of Joe each day shouldn't negatively impact your writing, but it probably won't enhance your writing, either. Maybe you should try getting some extra sleep before grabbing for that extra cup (or two) tomorrow! How does caffeine affect you?